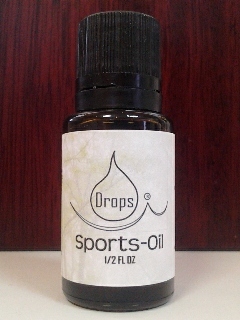 Home > Drops® Essential Oils > Drops Sports Oil, 1/2 oz. Drops® Sports Oil, 1/2 oz. Use Drops® Sports Oil after a workout! For the active sports addict. May be used directly as a rub or added to your bath, massage oil or lotions. Contains 100% Pure Therapeutic Grade Essential Oils of: Eucalyptus, Ginger, Lavender, Peppermint & Vitamin E.
Dilute when using on sensitive skin.